All of my fluorocarbon leaders are made from 150 lb ANDE Fluorocarbon Leader Material. Although not well branded as a freshwater line, ANDE is well known in the saltwater community, has always stood up under every conceivable fishing condition and situation and holds over 1,700 IGFA World Records. Many of these records represent outstanding catches throughout the history of IGFA. All Fluorocarbons are not equal. ANDE is 100% Fluorocarbon with all the properties you expect from Fluorocarbon Leader material, strong abrasion resistance, low stretch, doesn’t absorb water, sinks quickly and is totally invisible under water. Fluorocarbon leaders are constructed to provide a loop which is the strongest in the industry. For this thickness of fluorocarbon, experience has shown that crimps provide the strongest connection. 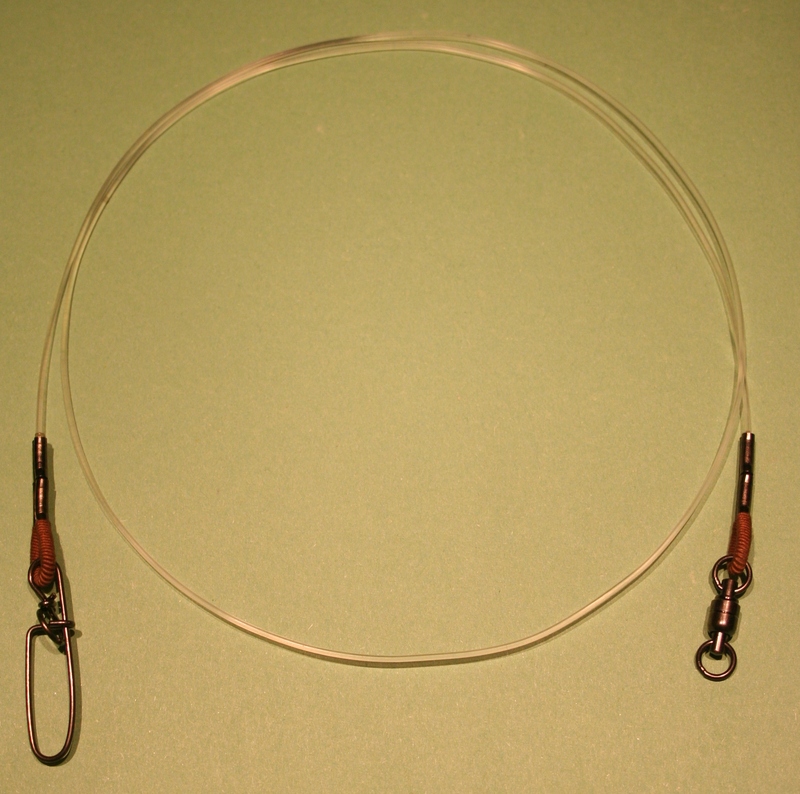 Single crimps are used on the casting leaders and doubles on the trolling leaders. 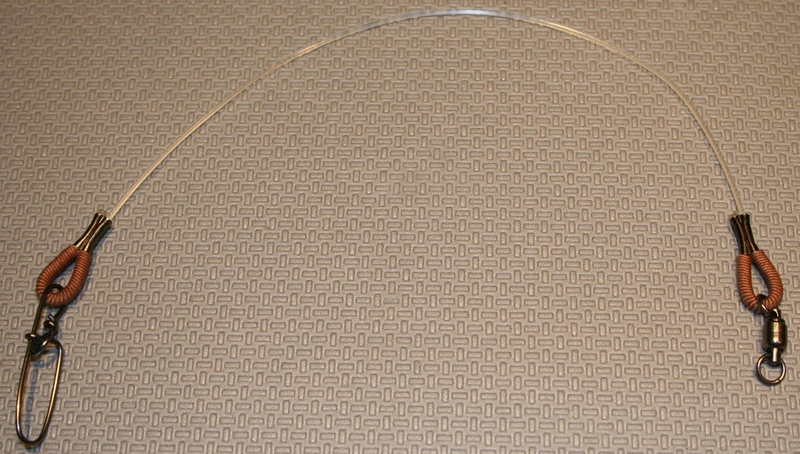 We start by melting the end of the fluorocarbon to form a ball which in itself makes it nearly impossible to pull the leader end though the crimp even before the crimp is squeezed. A plastic coated steel spring loop protector is used to prevent the snap or swivel from chaffing against the fluorocarbon in the loop, thereby greatly increasing the life of the leader. Another area of concern that needs to be dispelled is the use of crimps. No doubt you have all heard various muskie enthusiasts say “I don’t trust crimps”. They have all probably had an experience with a poorly crimped leader or more commonly, used a leader that was too thin for crimping and where a knot would be superior. Personally, I would not use a crimp on any fluorocarbon material under 80 pound test. Huskie Muskie leaders are all made with 150 pound test and the crimps provide a superior connection than a knot. Crimped leaders are the leaders of choice for salt water applications for fish species that are quite a bit bigger and fight harder than muskies. Enough said. Trolling Leaders come in two lengths, the standard 3 foot and the 6 foot St Lawrence Special. Both feature the Ande Fluorocarbon Material, #6 Stringease Stay-lok Snap, 175 lb ball bearing swivel, Coil Spring Loop Protectors and are double crimped for added strength. Many of our customers report being able to get an entire season from one leader if care is taken to change out the snap when it shows signs of weakness.